Considering what a splash Peele made with Get Out two years ago, it’s not surprising that this follow-up picture has been so eagerly anticipated. But what was so fresh and ingenious about Get Out was the audacious racial satire; when it turned into a conventional horror film in the last half hour, with its protagonist (Daniel Kaluuya), a young black man trapped in a community of self-professed white liberals who turn out to be nightmare racist villains, hacking away at his captors as if they were zombies, it stopped being interesting. 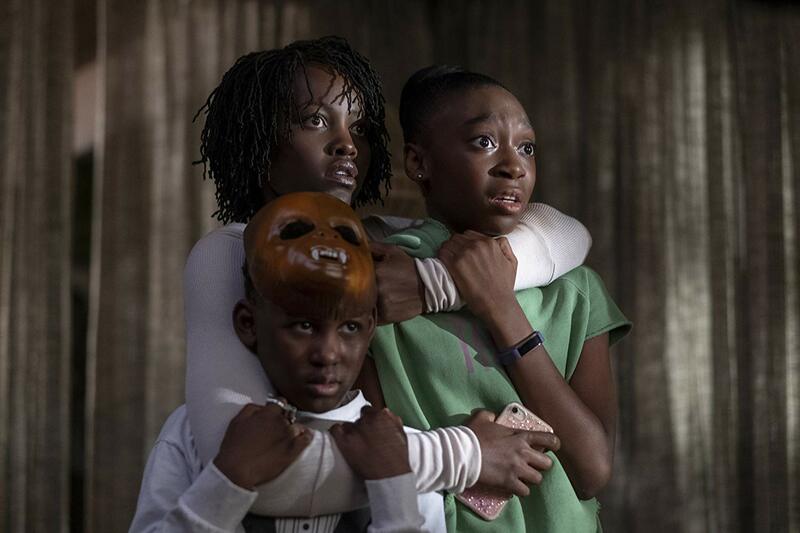 Us doesn’t have a satirical tone or a sly subtext; it’s purely a horror film – and Peele doesn’t have a gift for horror. He comes up with exactly one good idea, that the invaders look just like their targets, and it’s hardly original with him; he lifted it from Invasion of the Body Snatchers. I thought he had a fine touch with his cast in Get Out, but they had something to play; this time his crew of actors, which include Elisabeth Moss and Tim Heidecker as the friends Adelaide and her husband Gabe have joined in Santa Cruz, struggle with one stock sequence after another. As Adelaide, Nyong’o looks freaked out and as her twin she gets to speak in a hoarse voice, as if someone had taken a knife to her vocal cords. Duke, so captivating as the leader of the mountain tribe who challenges Chadwick Boseman for the throne in Black Panther, isn’t especially convincing as Gabe. (He’s more successful as the bad Gabe twin, but it’s really just a monster role.) The two kids are photogenic but as actors they don’t make much of an impression. The dénouement takes nearly a whole half hour of screen time, and naturally there’s a twist. We’re in The Sixth Sense-Fight Club territory here, where the only virtue of the narrative punch line is that you didn’t see it coming. Well, of course you didn’t, because it doesn’t make a lick of sense, just as the revelation in The Sixth Sense still didn’t explain why ghosts were beating up Haley Joel Osment and when you got to the twist in Fight Club and run the story back through your head it was even more perplexing than while you were watching it. I thought the point of a suspense thriller with an unpredictable reveal was the cleverness of the plot mechanics, not just the fact that it’s blindsided you. Sitting through a cruddy picture like Us makes me admire the horror filmmakers in recent years who have come up with twists that don’t sell the movies they pop up at the end of down the river, like The Others and the unsettling, messed-up Dream House. I’d recommend streaming one of them instead of wasting an evening on Us.